The much awaited new CR-V will be in markets next week but I got to drive the SUV in Udaipur and from first impressions its a highly evolved SUV. There are several new strengths it adds to its suit, such as the new design and interiors which make it look nicer than before. There are also the engines which are the same configuration as earlier but are more powerful, uprated suspension which offers better ride quality and better handling. There is a host of new features and luxury accompaniments all of which make this one of the best SUV you can buy in the market. The most attractive proposition the CR-V has is that it will be assembled at Honda's plant in Greater Noida from kits imported from Thailand. That only means one thing a considerably cheaper CR-V as compared to the previous generation. So we expect the pricing to begin around 19-20 lakhs going all the way up to around 27 lakhs for the top of the line variant. This should position it as a strong competitor to the Fortuner, the X1 and probably even a few sedans such as the Passat, the Camry and the Superb. On the flip side this also works against Honda as it also means its a better package than the Accord. The new fourth generation CR-V is considerably different from the older SUV. It's got a very striking front face which attracts a lot of attention. It makes the CR-V look fresh and stylish and all the chrome gives it a premium air as well. Dimensions have changed, the new CR-V is shorter in length by 30mm taking overall length to 4545mm. But at 2620mm it maintains the same wheelbase as before and it's also grown slightly taller, an additional 5mm takes it to 1685mm. However if you thought the drop in length will reduce interior space you're wrong. In fact space has increased because the firewall and the windscreen have moved ahead and this allowed the designers to provide more legroom for both front and rear passengers. The rear is another as that receives significant changes, the tail lamps are more angular with sharp edges and wrap themselves around the corners. The rear windscreen glass area looks smaller on a larger hatch and visibility is affected because of this. You can't see much out of the rear but to make matters simpler every CR-V comes with a reversing camera so that sorts out any issues while parking or reversing. The interiors have also changed, there is a new dashboard with a host of new features embedded in it. Starting from the steering wheel, it's a new design incorporating audio controls, cruise control and the multi information display selector as standard fitment across the range. The Top of the line variant will also get Bluetooth telephone connectivity so there is an additional set of switches to receive or cut phone calls. The instrumentation looks sporty with a very large and clear to read speedo flanked on either side by the tacho and fuel and temp gauge. The centre of the speedo also houses a display that reads out vital information. Base line variants get an audio system with, DVD, USB and iPod connectivity, the top of the line variant adds a satellite navigation to the mix. I drove a pre-production model and the build quality is typical of Honda with tight shut lines, smooth unruffled edges and great material quality making its mark yet again. Even the doors shut with a satisfactory thud that would make a German proud. highways, but it transfers torque to all four wheels only when it is necessary. Power ratings for the 2.0-litre engine stand at 156PS with 190Nm torque and the 2.4-litre has 190PS with 226Nm torque. ARAI fuel certification pegs the 2.0-litre petrol CR-V's efficiency at 13.7kmpl while the 2.4 does an equally handsome 12kmpl. I drove both engine options and I must say I enjoyed the 2.0-litre petrol with the 6-speed manual shift better than the larger engine. It's more responsive, has better low down and mid range torque characteristics and overall feels much more linear. The manual transmission also feels more refined than the automatic and less noisier overall. This 2.0-litre petrol is the winning hand for Honda. Another area that has evolved is the suspension. The CR-V gets a smoother underbody enhancing air flow to make it more aerodynamic and thus more efficient. The steering is now electronically assisted which is an aid for better efficiency. But what matters most is that the suspension is a bit stiffer resulting in much better ride quality and much more stable and confident handling. There is a bit of body roll and you do get a sense of it in the city where corners are tighter or out on the highways where surfaces aren't even. However in longer corners the CR-V feels a lot more confident trailing that arc. The steering too feels well weighted despite the electronic assistance. 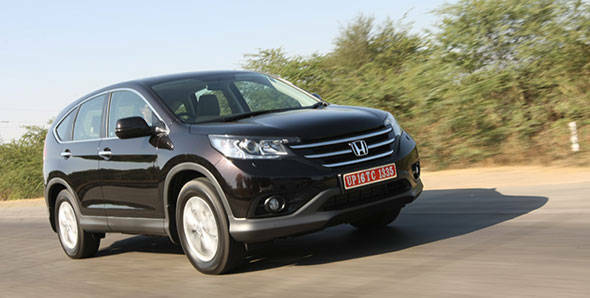 Altogether the CR-V had good impressive dynamics and that character has got better. The CR-V comes with 265/65 17" Tyres made by Michelin however these Tyres are a bit noisy especially on concrete roads. Apart from the automatic transmission whine, the Tyres are the only other noisy bit in this SUV. As standard fitment you get everything you will need in a luxury SUV. Leather upholstery, powered windows and ORVMs, powered driver seat, climate control, reversing camera with proximity indicators, audio controls on the steering wheel, cruise control and a swank audio system. You get a 60:40 split rear seat which has a clever innovation. From the boot if you ever need additional space, pulling on a small lever makes the rear bench flip forward and fold into the floor automatically without you having to get inside the vehicle at all. Ingress and egress is tidy, you simply walk into this cabin. However the rear bench is positioned in my opinion a bit too low to provide adequate thigh support especially for taller people. This will make long journeys tiresome unless you take a break to stretch you legs every couple of hundred kilometers. Moving up the variants, and there are four of these, two for each engine option, you add stuff such as Hill Start assist which basically does not allow the vehicle to roll back if you are parked on an incline. It then goes all the way to the top variant where you also get a 6.1" touchscreen audio visual system, satellite navigation and Bluetooth telephone connectivity along with a sunroof and HID head lamps with washers. The CR-V has a lot of potential to lead the entry premium end of the SUV market by storm. It's got all the mechanical aggregates that made it a very popular SUV back in the early 2000's but offering a more mature and evolved version of the same in current guise. Its also being assembled in India now which I hope will make the pricing way more attractive than whats its ever been before this. The styling I am sure is going to be highly appreciated as is its ride quality, features and the feel of that 2.0-litre petrol. And in that last word also lies its singular worry, it's a petrol. I can go on about how petrols make little sense in our current fuel price sensitive market. I can also argue to the converse about how petrols are still a good investment if your usage isn't high. And that is where the problem arises because the CR-V isn't an SUV that you will keep confined to urban areas alone.